A fun introductory lawn croquet set made in France by Vilac, the maker of fine toys. 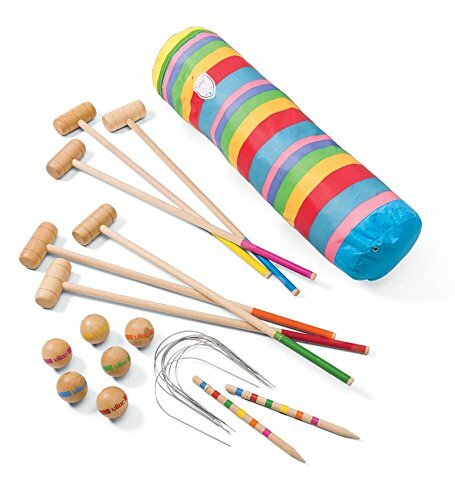 This set includes 6 brightly colored wooden mallets and balls, sized perfectly for children ages 5 and up. Also includes 6 metal hoops and 2 wooden winning posts. Comes packed in a colorful zip fastening bag. This croquet set will provide hours of fun for your little ones and is lovingly crafted by Vilac whose toys are adored throughout the world. They are true heirlooms to last generations. If you have any questions about this product by Vilac, contact us by completing and submitting the form below. If you are looking for a specif part number, please include it with your message.